Since early February the crisis, which has been developing over the sovereign debts of some of the weaker countries of the Eurozone, has brought the Eurozone countries in particular and the EU in general to a crossroads. The Eurozone is now faced with the choice of either going forward to real economic federation or seeing the Euro collapse as a shared currency. If the currency were to collapse the entire European project would be placed at risk. Initially the crisis was considered a fairly minor one affecting Greece, which is only a small country in the Eurozone. However, since Greece was unable to devalue the currency in order to devalue its debt and make its exports more competitive, the financial markets started to speculate on a Greek debt default. Greece’s credit rating on government debt was reduced to “junk” status, equivalent to a country such as Panama. As a result the cost of Greek borrowing in the capital markets increased to the point where it became too expensive for the government to borrow. Since it was well known that the country had to repay €25 bn of existing debt in April and May and €54 bn by the end of the year, the financial markets started betting frantically on a Greek default. At one stage in April the interest on Greek 2 year government bonds had risen to 38% and that on 10 year bonds to 10%! The UK by comparison paid only 1.2% on its 10 year bonds in April. Greece also was forced to pay enormous premiums on insuring its debt. 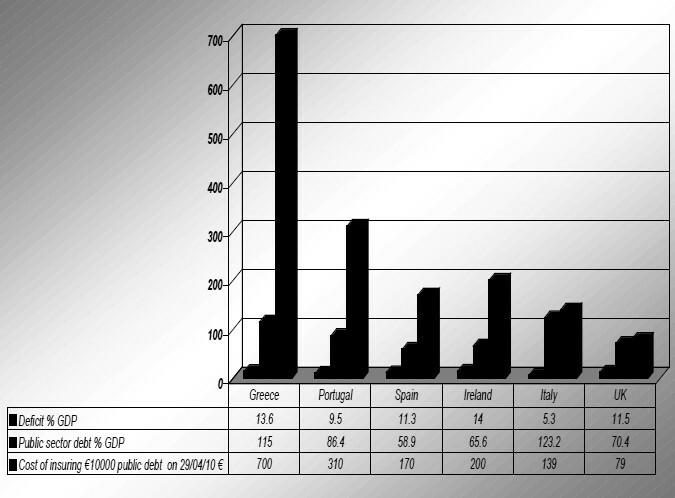 The fact that other weaker Euro countries, namely Portugal, Spain, Ireland and Italy, were in a similar state as regards their sovereign debts, led to speculation on the default of these countries also. (See Table 1). Speculation over Greek debt led to selling of the Euro which has now lost 20% of its value against the dollar since the start of the year. The minor crisis affecting Greek sovereign debt has rapidly escalated into a major crisis affecting the Eurozone, the EU and the entire global economy. Although the German Chancellor, Angela Merkel, described the crisis as the “biggest crisis the EU has faced since the Treaty of Rome was signed in 1957”, the EU and the Eurozone countries proved incapable of decisive action. While they dithered the cost of bailing out Greece increased dramatically, because the country became less and less able to borrow on the capital markets more funds had to be provided for the rescue. Initially under €20 bn was pledged but in mid April this had been increased to €45 bn and in early May this was again increased to €110 bn. On top of this another €750 bn loan facility was put in place to defend Portuguese, Spanish, Irish and other Eurozone countries against speculation. At the same time the European Central Bank (ECB) has also undertaken to buy the bonds of the weaker countries when necessary which amounts to “quantitative easing” despite official denials. These enormous sums were raised to prevent another “Lehman Brothers” type collapse causing the global financial system to go into meltdown mode again. This was considered the key issue, not simply for the EU, but for global capitalism as a whole. US President, Obama intervened to goad Chancellor Merkel into action and brought in the IMF to increase the loan facility to a size where speculators would be discouraged. The sums supplied by the IMF were enormous even by its own standards; €30 bn for the Greek bailout and €250 bn for the larger Euro defence package. For the present these measures appear to have stabilised the situation. Greece does not have to borrow capital on the open market and speculation on the Euro and Greek debt has abated. Closure of 800 state entities. The plan amounts to an attempt to nurse the Greek economy back to life by imposing Draconian cuts in pay and living conditions on the Greek working class, reform of the public sector and increased taxation. All this is being imposed in the hope that the economy will grow providing the Greek government with the necessary income to pay its debts. The measures will, however, lead to deflation, contraction of the economy, high unemployment and a further inability of Greece to pay its debts. This is likely to lead to a debt default in the end and the present stabilisation package is certainly not the end of the story. It needs to be pointed out that the lion’s share of the Greek debt is held by German, French and UK banks. (1) The bailout, although apparently a bailout of the Greek state, is essentially another bailout of European banks that stand to lose billions of Euros if Greece defaults and restructures its debt. Countries such as Greece, Ireland, Portugal and Spain were, until the banking crisis of 2008 exploded, hailed as brilliant success stories with the highest growth rates in the Eurozone. Greece, for example had a growth rate of 4.2%, well above the EU average. Its main sources of income were shipping and tourism but both have been hit by the global downturn following 2008 making the burden of debt much harder to finance. The Greek debt crisis is not derived from Residential Mortgage Backed Securities (RMBS) e.g. subprime property lending, like the 2008 banking crisis. Instead it is based on government debt used to finance fiscal deficits. However, this crisis is clearly linked to the earlier banking crisis and represents a continuation of that crisis. Before considering the implications of this crisis on the future of the EU it is necessary to restate again where the real roots of the crisis lie. Crisis of the early 70’s was caused by greedy oil producers increasing the price of oil. Crises of the mid 70s were caused by greedy workers demanding increases in pay. Crises of the 80s were caused by reckless borrowing by governments of developing countries. Asian debt crisis was caused by currency speculation in the financial sector. Crisis of 2008 was caused by greedy bankers speculating on RMBS e.g. subprime. Present EU crisis is caused by reckless governments and fraudulent politicians mismanaging state budgets in countries such as Greece, Portugal and Ireland. This is despite the fact that only a few years ago these countries had the highest growth rates in the EU and were being praised to the skies. Bourgeois economics cannot admit that there is anything fundamentally wrong with the capitalist system of production as a whole. Instead we are given a picture of a fundamentally sound system which is periodically plunged into crisis by a few people with psychological problems. They are too greedy, too short sighted too stupid etc. and once we eliminate these failures the future will be rosy once more. The pathetic nature of these explanations simply illustrates that the real role of bourgeois economics has become one of disguising capitalism’s underlying problems and producing apologetics for the existing class structure of society. That is apologetics for the existing property relations which entail one class, the capitalists, monopolising the means of production and thereby all the wealth produced while another class, the working class, own nothing but its ability to work, that is its labour power. Such apologetics are used to camouflage the continual demands which are made for the working class to make sacrifices and accept hardship to enable the system of transfer of wealth to the capitalist class to continue. It is clear; however, that the banking crisis which struck in 2008 has exposed the intellectual bankruptcy of bourgeois economic theory with a clarity, which even its most hardened apologists cannot hide. After the collapse of the US investment bank Lehman Brothers, the grand theoretical edifice of neo-liberalism, which had, since the 1980s, become the dominant bourgeois economic theory, was swept away in a matter of weeks. When the entire financial system faced collapse, the national states of the key capitalist countries intervened to save the system. The massive injections of funds by these states represented a practical demonstration of the complete failure of the famous markets, which underpinned neo-liberal theory, to deal with capitalism’s problems. It represented the jettisoning of “neoliberalism” as a theory. In its stead we saw a return to deficit financing and devaluation of currencies by “quantitative easing” which represent a return to Keynesian solutions which were derided as “ineffective and rubbish” in the early 80s. The result of the state rescue of the banks, however, has been to transfer the banking losses into public debts. Although this has allowed the initial phase of the banking crisis to be weathered it has massively increased state debts to the point at which some states, e.g. Greece, Portugal, Ireland, Iceland etc., are threatened with bankruptcy. This has led to the realisation that the entire system is again teetering on the brink of an abyss and we are seeing a return to attempts to balance budgets by cutting state spending and raising taxes. These measures represent an abandonment of the Keynesian solutions of 2008 in favour of their direct opposite. They represent a return to aspects of the discredited neo-liberalism which preceded the crisis. At present there seems to be no recognition of the fact that balancing of budgets will produce massive contractions in the size of the economy reducing tax take, increasing unemployment and increasing state expenditure. The attempt to balance the budges was, in fact, the policy of US President Hoover from 1929 to 1933 and resulted in the halving of US GDP in this period. All these measures are now implemented without any theoretical underpinning and appear as “ad hoc” measures to deal with the effects of earlier policies, effects which appear not to have been foreseen. Their aim, which is now only feebly disguised by appeals to national unity in the face of capitalism’s incipient collapse, is clearly to rescue the system by enforcing greater exploitation of the working class. In other words the part of the social product which goes to the working class is to be reduced and the part which goes to the capitalist class is to be increased. In contrast to bourgeois economics, what Marxism has always attempted to do is to trace the phenomenal world of capitalism to the underlying social production relations. What all these crises point to, in one way or another, are the historical limits of the capitalist system, limits which it cannot overcome. The crisis represents an interruption of the process of capital accumulation as a result of causes internal to the system. By interrupting the process of capital expansion and only enabling it to resume after a process of devaluation of capital the crisis points to the historical impasse facing the system. Only through internal cannibalisation of the wealth it has produced can it resume capital accumulation and limp on to the next crisis. The capitalist economy is, in fact, regulated by its crises rather than any of the discredited theories put forward by bourgeois economics. Capitalist prosperity depends on the expansion of capital. Due to the fact of profit production, it is obvious that total social production requires the accumulation of capital to employ the same or an increasing number of workers. Only a part of the total social product falls to the working class; another part serves the consumption needs and the competitively enforced accumulation needs of the capitalists or capitalist corporations. When the part of the social product earmarked for accumulation is reinvested in additional capital, implying its profitability, there exists a state of prosperity, with a minimum of unemployed labour and a maximum utilisation of the means of production. In brief, prosperity depends on the rate of accumulation which, in turn, depends on the given profitability of capital (2). Profits can only be made through the exploitation of the labour of the working class and consequently they can only be made through production. (3) Although the profits produced in production are distributed in interest to banks, in rent to landlords and in commercial profit to shopkeepers, if one considers the entire global system, the profits of these sectors are all deductions from the profits produced in production. (4) Within the capitalist system as a whole, exploitation of the working class is the only source of surplus value and hence the only source of profit. (5) If profits are insufficient with respect to existing capital values, no matter whether these values are real ones, such as those of General Motors, or fictitious ones such as sub-prime mortgage securities or the Greek national debt, the claims based on them cannot be met. Part of the existing capital therefore ceases to function as capital since its profit needs cannot be satisfied. The decline in profitability leads to a relative stagnation of production which in turn leads to speculation. The section of social product, which should go to accumulation, is instead diverted to speculation which leads to inflation in prices of the objects of speculation, for example, property, equities, certain commodities etc. The capital which has been diverted to speculation, however, still demands its share of the global profit. This only increases the discrepancy between the profitability of existing production and the need to accumulate capital and expand production which is required for prosperity. This leads to a crisis in which part of the existing capital, whose profit requirements cannot be met, is devalued or written off. The speculation in Residential Mortgage Backed Securities, derivatives, currencies and other forms of gambling carried out by the major banks, which preceded the 2008 banking crisis, was an expression of the global decline in profitability of production. It was not a cause of the crisis which followed, it was an effect of the underlying crisis of profitability which has existed since the 1970s. Similarly the present inability of some Eurozone governments to service their debts is an effect of insufficient profits generated in industrial production to service global debts. Today’s turmoil in regard to state debts is the visible manifestation of this underlying problem. The cause of the crisis remains the tendency of the profitability of capital to decline. The present austerity, which is being imposed on the European working class, is an attempt to increase profitability by reducing wages of workers who are employed and the benefits of those out of work. The value taken from the working class is, of course, transferred to the capitalist class. This raises the profitability of capital and thereby provides additional value to be distributed amongst the capitalist class as a whole. Of course, this includes banking and finance capital who are demanding interest on their loans. Although the crisis has expressed itself in different forms over the last 4 decades this is largely the result of the crisis being shifted from one sector or region to another. These different forms, which the various crises have taken over the years, are simply different manifestations of the underlying problem of the profitability of capital. It is clear that the EU is quite unable to solve these problems since they are systemic ones of global capitalism. The present austerity doled out to Europe’s workers is a short term measure which can at best provide a breathing space for European capital. The capital which cannot be serviced by the surplus value squeezed out of the working class will have to be devalued or written off in one way or another. The only option open to the EU is the imperialist one of pushing its problems onto others and finding ways of drawing more of the global surplus, produced by the world’s workers, into its economic sphere. The Euro currency was created as vehicle for EU imperialism. It was set up as a challenge to the US dollar with the intention of taking part of the surplus the US was able to attract through the international use of the dollar. Because the dollar circulates outside the US as the main global currency of commodity trade, especially the trade in oil, and because the US has control of the currency, it is able to increase the volume of dollars in circulation to match increases in global trade and finance its trade deficit by creating dollars. It is estimated the US gains in the order of $500 bn annually in this way. The creation of the Euro was an attempt to muscle in on this massive “free lunch” which the global use of the $ gave the US. In the 11 years of its existence the € has made inroads on the dollar’s dominance. It has become a reserve currency held by many central banks, a currency in which international loans are raised and a commodity trading currency, notably for part of the oil trade. The € is starting to take part of the surplus previously attracted by the dollar. For this reason alone the main Euro countries, particularly Germany and France, will fight for its survival. The Euro was established as the currency of a bloc of countries which were politically independent and operated different fiscal regimes. Although there were rules for budget deficits, national debt to GDP ratios etc. there was no regime of oversight or means of enforcing the rules. During periods of prosperity the Euro worked very well. Germany, for example, saves €10 bn annually in currency exchange costs through the common currency, (6) and half of its trade surplus of €80 bn (7) is with the Eurozone. Peripheral countries such as Greece, Portugal and Spain, which have a collective trade deficit of €102 bn, half of which is with the Eurozone, are able to fund this deficit by cheap loans from the European Central Bank. The weakness of this system has been exposed in the present crisis. The Eurozone countries have no way of dealing with a crisis of default and international speculation against the currency. Germany, which is obliged to provide 28% of all the EU bailout funding, is determined to bring in changes which will provide the EU paymaster with greater control over how the money is spent. The loan facilities for Greece have already put the country in a position where it has lost control of its fiscal policy which is now being imposed on it by the ECB. Similar medicine will be meted out to Spain and Portugal should they need to use the larger loan for protection of Euro bonds. The €750 bn standby facility created represents a pooling of resources for defence to the Euro or a step towards fiscal integration. The creation of a European Monetary Fund to deal with crises like the present. This would be funded by levies on countries which broke EU fiscal rules and borrowing on the capital markets. A regime of oversight to ensure the ECB loan conditions are enforced and countries, like Greece, did not fiddle their accounts as happened under the previous Greek government. Alteration to the Lisbon Treaty to bring these measures into effect. The lack of political unity in the EU makes moves towards economic federation difficult to achieve. The Eurozone needs to become a political entity with a centrally controlled budget and powers of taxation and spending. The only alternative to greater coordination of economic policies is dissolution of the Euro. This would be a cataclysmic blow to the European project and, for Germany, particularly devastating. ...The decision made in Brussels is a very important step towards European fiscal federation, etc. (9). The more intelligent sections of the bourgeoisie recognise that the future is either European integration or collapse. Their problem is to goad the protesting national states to move in this direction. Countries devastated by the crisis, like Greece, have little alternative but to agree to the terms dictated by the stronger states. The real problem is for the stronger states to agree on how to achieve this. It is clear, however, that it is the needs of European capitalism, which express themselves in the present crisis, which will be the driving forces the direction which the EU takes. At present this appears to be a course towards economic federalism. The present crisis is far from over. As explained above, the solutions, which the capitalist class is implementing, amount simply to attempts to transfer part of the social product which at present falls to the working class, to the capitalist class. There is no intention to increase production and employ more workers because profitability is too low. Even if these measures succeed temporarily they are short term measures and cannot address the underlying problems which are systemic. The only way forward is the abolition of capitalism as the global system of production. This process can only be started by workers resisting the attacks on their living standards and fighting for their own interests not those of capitalism. The workers have responded and are still responding. This first big class response in Europe is no accident. It has been produced where the crisis has bitten most ferociously. The streets are once again full and inevitably there has been no shortage of clashes with squads of police in riot gear. The anger of the Greek working class is breathing life into strikes and organised demonstrations which have not been seen for years (10). Without the active and working presence of a revolutionary party such anger and readiness to fight is destined to turn in on itself. The Argentine episode also taught this but it was only the latest in a long line. The history of class struggle is rich in these kind of situations where the response of the world of labour to the devastating consequences of the economic crisis doesn’t come up with an adequate political strategy which only a class party can put forward. Therefore mankind always sets itself only such tasks as it can solve: since looking at the matter more closely, it will always be found that the task itself arises only when the material conditions for its solution already exist (11). The material conditions for the creation of a communist (12) world have never been better than they are today even though the consciousness of the need to create such a world is absent. It remains, however, the only hope for the future for humanity. The alternative is the collapse of civilisation into a state of barbarism. (1) UK banks for example hold €100 bn of “toxic” Greek debt. (2) Economics, Politics and the Age of Inflation. Pg 117. (5) This is, of course, vehemently denied by bourgeois economists who refuse to consider the system as a whole. They further reject the classical labour theory of value, which Marx developed from Adam Smith and David Ricardo, in favour of the subjective one of “marginal utility” in which almost anything becomes possible. (7) See Financial Times 2010-02-25. (9) See Financial Times 2010-05-01. (11) See Preface to the Critique of Political Economy marx/works/1859/critique-pol-economy/preface.htm . (12) When we use the word “communist” this has nothing whatsoever to do with the systems which existed in Russia and China which we characterise as “state capitalist” systems.